What a busy year it was for new brewery openings in Colorado. In 2014, Colorado saw a record 64 new breweries open it's doors, plus a few more re-opened after being shutdown temporarily. Compared to 2013, where Colorado had roughly 48 brewery openings, 2014 has 29% more openings. In rather good news, there were no brewery closings during the year, which tells you that 2014 was a great year to open a brewery. While no brewery shut it's doors for good, there were a few name changes (due to litigation) and a merger or two, some relocations and a couple re-openings. But how will 2015 go for new breweries? There are still over 100 breweries in line to open up here in the state including around a dozen in the next month alone. 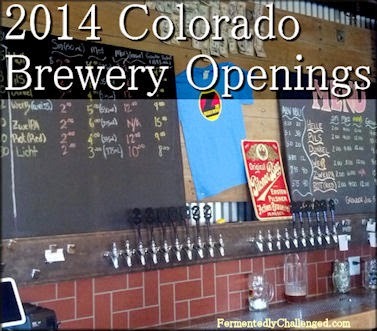 Here is the list of newly opened or re-opened Colorado breweries for 2014. How many have you visited already? Did I miss any? If so, let me know. -- Moffat Station Restaurant and Brewery - brewing again - started January after 8 months off. 1 - The Post Brewing Company - Lafayette, CO - January 9, 2014. 2 - Kokopelli Beer Company - Westminster, CO - January 10, 2014 - brewpub w/food. 3 - Stem Ciders - Denver, CO - January 10, 2014. 5 - 7 Hermits Brewing Co - Eagle, CO - February 2, 2014. 6 - Lowdown Brewery + Kitchen - Denver, CO - February 11, 2014. 7 - Compass Cider - Ft. Collins, CO - February 14, 2014. 8 - Two22 Brew - Centennial, CO - February 22, 2014. 9 - 300 Suns Brewing - Longmont, CO - February 22, 2014. 10 - Manitou Brewing Company - Manitou Springs - March 1, 2014 - soft opening. 11 - 1933 Brewing Company - Fort Collins, CO - March 11, 2014. -- Compass Cider & Blossomwood Cidery - merged - March 2014. 12 - Creede Brewing Company - Denver, CO - March 24, 2014. 13 - Freedom's Edge Brewing Company - Ft. Collins, CO - March 27, 2014. 14 - Roaring Fork Beer Company - Carbondale - March 28, 2014. 15 - Abundant Waters LTD - Greeley, CO - April 16, 2014. 16 - Blue Spruce Brewing Company - Centennial, CO - April 26, 2014. 17 - Comrade Brewing Company - Denver, CO - April 26, 2014. 18 - Coda Brewing Company - Aurora, CO - April 29, 2014. 19 - Horse & Dragon Brewing Company - Ft. Collins, CO - May 1, 2014. 20 - 4 Noses Brewing Company - Broomfield, CO - May 8, 2014. 21 - 38 State Brewing Company - Littleton, CO - May 10, 2014. 22 - Wonderland Brewing Company - Broomfield, CO - May 15, 2014 soft open - May 30 Grand Opening. -- Vindication Brewing Company (formerly Kettle & Stone Brewing Co) - name change - May 23, 2014. 23 - Walter Brewing Company - Pueblo, CO - May 23, 2014. 24 - Broken Compass Brewing - Breckenridge, CO - May 30, 2014. 25 - Denver Pearl (Platt Park) Brewing Company - Denver, CO - May 27 (soft open) - June 7, 2014 G.O. 26 - Mu Brewery - Aurora, CO - June 7, 2014 (soft opening). 27 - Three Freaks Brewery - Highlands Ranch, CO - June 13, 2014. 28 - Chain Reaction Brewing Company - Denver, CO - June 21, 2014. 29 - Butcherknife Brewing Company - Steamboat Springs, CO - June 27, 2014. Soft opened 6/20. 30 - Beryl's Beer Company - Denver, CO - June 28, 2014. 31 - Fieldhouse Brewing Company - Colorado Springs, CO - June 28, 2014. 32 - Berthoud Brewing Company - Berthoud, CO - June 28, 2014 soft opening - G.O. July 4th. 33 - Storm Peak Brewing Company - Steamboat Springs - June 28, 2014 soft opening. 34 - Casey Brewing and Blending - Glenwood Springs - July 3, 2014. 35 - Hideaway Park Brewery - Winter Park, CO - around July 9, 2014. 36 - Living the Dream Brewing - Highlands Ranch, CO - July 12th 2pm. 37 - Powder Keg Brewing Company - Niwot, CO - July 12th 2pm. 38 - Finkel & Garf Brewing Company - Boulder, CO - July 14th. 39 - Joyride Brewing Company - Edgewater, CO - July 18th. 40 - Denver Beer Company (Canworks 2nd location) - Denver, CO - July 2014. 41 - Liquid Mechanics Brewing Company - Lafayette, CO - August 16, 2014. 42 - Iron Bird Brewing Company - Colorado Springs, CO - August 16, 2014. 43 - Zwei Brewing - Ft. Collins, CO - August 20th, 2014. 44 - Snowbank Brewing Company - Ft. Collins, CO - August 22nd, 2014. 45 - Dodgeton Creek Brewing Company - Trinidad CO - August 28, 2014. 46 - Bottom Shelf Brewery - Bayfield, CO - August 29, 2014. -- Smiling Toad Brewery - Colorado Springs - September 5, 2014 - moved to new location. -- Platt Park Brewing Co - Denver, CO - September 6th - renamed from Denver Pearl Brewing Co.
48 - Ute Pass Brewing Company - Woodland Park, CO - began brewing ~ September 6th. 49 - Grand Lake Brewing Tavern - Arvada, CO - new taproom only - September 11, 2014. 50 - South Park Brewing Colorado - Fairplay, CO - September 19, 2014. 51 - Wolfe Brewing Company - Pagosa Springs - September 25, 2014. 52 - Lost Highway Brewing Company - Denver, CO - September 26, 2014. 53 - Fiction Beer Company - Denver, CO - September 27, 2014. 54 - Grandma's House - Denver, CO - October 1, 2014. 55 - Mancos Brewing Company - Mancos, CO - October 18, 2014. 56 - Fossil Brewing Company - Colorado Springs - October 24, 2014. -- Climb Hard Cider Company - Loveland, CO - Name change from Blown Spoke - end of Oct.
57 - Mockery Brewing - Denver, CO - November 7, 2014. 59 - FERMÆNTRA - Denver - November 13, 2014 (soft) - Nov. 15th G.O. -- Three Barrel Brewing Company - Del Norte - moved to new location - Nov. 20, 2014. 61 - Alpine Dog Brewing Company - Denver - soft 11/15 - Nov. 22, 2014 G.O. 62 - Storybook Brewing - Colorado Springs - November 25th, 2014. 63 - Zephyr Brewing Company - Denver - December 5th 4pm. 64 - Animas Brewing Company - Durango - December 27th. Updated Jan. 22, 2015: Thanks to my readers, there were a few breweries I missed - Storybook Brewing - Colorado Springs, CO - opened November 25, 2014. Also, Wolfe Brewing Company in Pagosa Springs (Sept), and Denver Brewing Co's 2nd location (July). Also added Marcos Brewing Co in Mancos, CO (October) and Bottom Shelf Brewery in Bayfield, CO (August).